Simply buy it and play! Amongst the excitement surrounding this project it seems that a lot of people aren't even aware that they can play Grim Fandango right now on modern PCs/Macs (provided you own the game), including Windows 7, Windows Vista, Windows XP, OSX, Linux, and... Amiga(!). It works perfectly with x86 or x64, and all modern graphics cards, including those made by NVidia and Radeon. 1. Own Grim Fandango -- Unfortunately the hardest step as the game is no longer available to buy new. Your best bets are eBay (US/UK) or Amazon (US/UK). Note: If you decide to get the game by nefarious means, I cannot guarantee it will work as expected! 2. 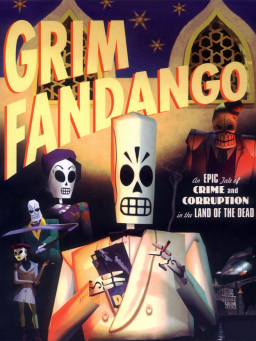 Copy the Grim Fandango files to your Hard Drive -- the following files from your Grim Fandango CDs to a new folder on your computer. The files should be found in a folder called "data" on your Grim Fandango CDs. 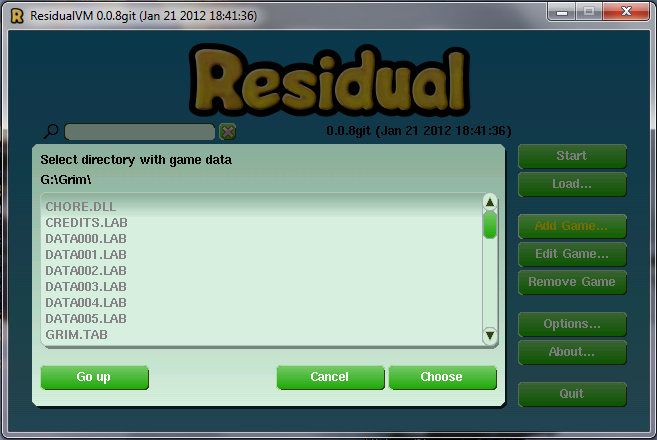 Note: You may also have additional .LAB files if your version is non-English. Some files are found on both CDs, just click "OK" to overwrite them if prompted. Place the Gfupd101.exe file you downloaded into the folder you previously created above (amongst all the .LAB files). If you don't have at least these files, the game will not function properly. If you do have these files and you're having some issues, try comparing the filesizes to see if they're the same. Just download the correct copy for your system and run the file to start the installation. 5. Let ResidualVM know where Grim Fandango is installed -- Within Residual click "Add Game..." and then navigate to the folder on your Hard Drive where you copied the game files (e.g. C:\Grim) and click "Choose". 6. Enjoy Grim Fandango -- If all goes well you just need to select Grim Fandango and click Start! It is worth noting that more hardware OSes, even modern, will run it with some tweaks. There are often sound bugs and other minor problems but on both computers I have tried to install it on it was more then playable and even ran perfectly after some setting fiddling. I'm not sure what you mean "more hardware OSes"? As I understand it, the game will not even install (never mind getting to play it) on Windows XP, Vista or Windows 7. And even if you use a replacement installer (like the one by BGBennyBoy) or hack it yourself (as seen here), and then use the replacement launcher (found here), you still have to use "Software Mode" otherwise get the problems shown here, and that's only it doesn't crash. Actually, step 3 is a bit simpler than it used to be now, all you need to do is get gfupd101.exe and place it in the game's folder, no need for extraction (which was tricky on non-windows anyhow, and not perfect there either if you hadn't installed properly). It's also worth noting that there MIGHT be additional .LAB-files on dubbed versions of the game, and that those are needed aswell. Thanks for your words of encouragement, Yury, but we cannot be associated with what you described, so I had to delete your comment. I hope you understand. Do you think you'll ever actually complete the project? Hi guys. I am running OS X 10.5 and I am having trouble applying the patch. I have the patch file and game files saved in a folder in my hard drive. The game run perfectly except for the elevator puzzle. I am currently wading through Xcode but I am not a talented or a competent coder. Any advice or suggestions ? Ahhhh! I still have my original copy, but I can't extract data003.lab from disk A! I have the french version... Think you can help? I had the same problem with credits.lab, data001.lab, and data003.lab on disc A of the german version. A few posts below this one, Steffen Klumpp posted a german tutorial video in which he describes that one can use IsoBuster to extract these apparently corrupt files, and the game will work anyhow. As it seems, there is some kind of copy protection embedded in each LAB file (which btw leads to these huge file sizes), so perhaps the file only appears as corrupt, while in fact it is not. There is a tool called "Labcopy" which "cleans" the LAB files from this copy protection, you may (have to?) use this one, too. Steffen Klumpp provides a link to an archive which contains all necessary tools, in the info section of his YouTube video. I myself extracted the apparently corrupt files with IsoBuster, cleaned them with Labcopy, imported the game into Residual VM, and until now the game works perfectly fine! All props to Steffen Klumpp! Thanks. Works perfectly. Too bad you can't save the game and continue playing later, or can you? Yes, you can do that, Andy. Unfortunately my laptop is running Windows 7 in 64-bit and the cut-scenes in the game are just blank, any way of getting it to work? I have been playing it on my girlfriends Macbook and works a treat on that. Only issue I have is the cut scenes being white, only showing subtitles. Any ways to rectify this? hmmm. This isn't working for me at all. Windows 7, 64-bit. I just keep getting an error message that says that it's an unsupported version and to download the patch and put it in the game data files directory. I'm pretty sure I've done that, although maybe I have to label the directory or something? Ideas? Hi i've got the game running fine via residualvm OS Win7 but can't get it fullscreen at all can someone help please?? Just press ALT + ENTER. Have you tried pressing FN and F1 together? The computer I originally installed GF on finally passed on a couple of years ago and I'd been wondering if there was any possible way I'd be able to install and play again on my new computer running Windows 7. It'll be so good to see Manny and the crew again. Sorry, I would play this game, but even if I done every steps when I press "start" on residualVM close all windows! warnig: SearchSet::add: archive 'C:\Grim|' already present! Glad I fixed mine. Thanks for the instructions! Seemed to work okay on Linux (64 bit with AMD Graphics), until the first cutscene ended. The mail arrived he said something in spanish and the game froze with the music stopped playing. I had to kill it in terminal. Nevermind, turns out I just didn't know the controls. I thought it was a point and click adventure, haha. I was going to say -- it works perfectly. Many many thanks, finally got to play this game after that many years. Would have never been able to play otherwise (bit of a no-no). Only thing, the clips are not showing (guess they are called Cutscenes!? ), all I get is a white screen with voice + subtitles, like someone else here. Anyway to see the clips? Haven't found a solution yet on the Internet. Wouldn't say half the fun of the game, but big a part it is (using W8/64bit). Michael, I've updated the post with some more information to help people. Can you tell me where what you have differs? Thanks. Just read the comment Filip V (3 July 2012 01:26) made and I noticed I have the exact same issue. Haven't read a follow up comment or info that could help. Or am I not reading correctly? Hi Michael, can you compare the files listed in the post with the ones in your GrimFandango directory? Compare names and filesizes and let me know where there's a difference (if any). yes they are exactly the same (already checked), size as well, give or take a few KB. Btw, I am using at the moment a trial version of W8. Beginning next week I will put my newly bought W8. Don't think it will make a difference though, everything else works just fine. You think the same trick works for ScummVM? Anyway, I might not be online 'till sunday or monday, will let you know if there are changes. Or perhaps you might come up with an idea. Wonder if Filip's his version is shwoing the clips now. Michael! If the filesizes are different by a few KB then there's something wrong with your files! They should be IDENTICAL, right down to the last byte. Please double check they are different. I just checked again, slightly different. That is odd, original game-cd's and hardly used. Just installed the W8, will check tomorrow (not that much time today). Would be a major bummer if the game is ruimed somehow. Clean W8 install didn't do anything (ofcours). Never download games, but did so yesterday, because I really, REALLY want to play and finish the game for once. When I opened the downloaded RAR file, the file sizes are exaclty the same as you the ones you wrote about, but once extracted they 'change' and the same thing happens once I start to play. I've made an tutorial-video for all the german Fandango-Players, I've mentioned your blog a few times during the video and in the description! And Mister Johnny Walker too, of course! Thanks!!! it's working on vista! How can I use the main menu and save the game etc? If I use F1 like normally, it just windows the game down and opens up some sort of a HP help- thing. Any other button for that? That's your HP Computer messing with things. Try disabling any HP software that's running It's still F1/F5 in the game. *And since I’ve already installed the basic game on my machine, should I uninstall it and remove any Grim Fandango files and folders before proceeding with the steps you outline in your basic post above? It might not make any difference, but I thought I'd ask. Once again - great site, and thanks for your help. First question: You need the Installer (not the Zip version, which is the same, but without an installer). And the Patch. Second question: It doesn't make any difference at all. Thank you so much for your quick reply. I'll get started tomorrow. For us old-timey Grim fanatics, your site is a God-send. One other question: There are two "Windows Installer" downloads on the ResidualVM.org page, and I note that your link in Step 4 above directs one to the "unstable" Daily Builds section of the page. (The added "#daily" at the end of the URL does this.) So - should I download and run the "Windows Installer (build from repository, 1816K Win32 exe file, last update: August 15, 2013, 12:46 pm)" (i.e., the potentially "unstable") file? My guess would be that the Windows Installer at the top of the page in the "0.1.1 Release binaries" section is the one I ought to download and run. All the latest progress is stored in the Daily Builds, so I usually recommend them ("unstable" is a bit of an exaggeration), but it won't make a huge difference if you go for the one at the top of the page. Just finished the game and wanted to report that it ran PERFECTLY. Not a single glitch or hiccup, and it looked and sounded better on my new system than it ever did on any of my old ones. For info: I'm running Windows 7 Pro, 64-bit, with 8GB DDR3 RAM on a Dell 660 PC. Graphics card: AMD Radeon HD 6570 w/1GB DDR3 onboard memory. Audio: AMD HD Audio Device (Integrated High Definition 5.1). Johnny: Thanks again for your help. Now I'm off to try to get several of the Myst games running on my new system, but I'm sure it won't go as easily as GF. All the best. Hi , the game run fine but i cant use mi usb gamepad , i tried to select the option from the game menu but it still in use the keyboard , please help ! Thank you for creating this blog, but I had problems with ResidualVM, so I used other way to run Grim Fandango on Windows 8 - I used replacement installer and launcher from Internet. As for me, games runs well. And in fact, as I discovered, old launcher is still working in Windows 8, but both game itself and old launcher need Windows 98 compatibility mode to run well. I have screenshoots, but I don't realize, how I can post them here. Works excellent on Windows 7 32-bit Ultimate. Thank you. This may be stupid question but is there a way to run the game in higher resolution? Not sure what you're doing wrong. Try pressing F5? I've no idea why you're having problems. I'm sure the ResidualVM guys would really appreciate it if you shared with them on their forums. I would guess that the save-path is set somewhere were you don't have write-access. 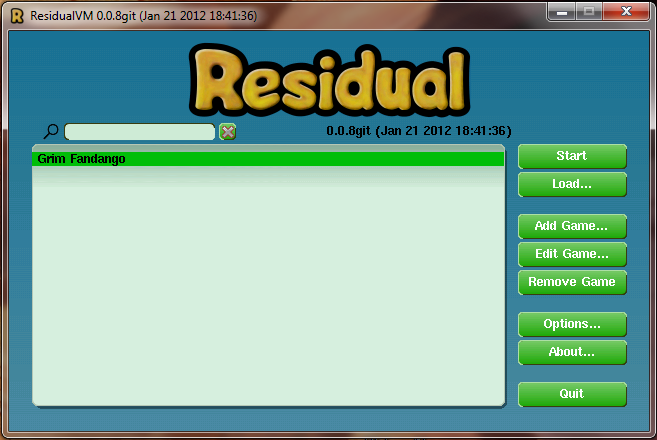 Try to change this in the launcher, by selecting the game, clicking edit game, then paths. Nice. Playing Grim in Windows 8.1 and all seems fine. Thanks for making it possible! Hi, I'm having problems running Grim in full screen. I tried using ALT+ENTER however it just expands the ResiduelVM window, the game screen stays the same size and the rest of the screen around it is completely black. Any suggestions? I tried changing the .ini file so that it reads "fullscreen=true" and also changed the settings within Residuel to play full screen but nothing seems to work. ANy help would be much appreciated! I have the same problem in 32 bit Windows 7. The same thing occurs in ResidualVM and with the third party installer/loader. Tried compatability modes but nothing works. Please help!! Thank you, you are awesome! That worked great on Windows 8. Thank you,it worked on Windows 7! Having trouble with mac 10.9.4 - When I click on residual it says PCpower not supported. Not very experienced with this type of program. Please advise - I was so excited to play. Hey there Jhonny. I can run and save the game perfectly, but when i quit and try to load the saved game it crashes. It shows a command prompt real quick ( i can't even read what it says) behind the loading game screen for just a second and then all closes automatically. I created a folder where i installed the game to path the ResidualVM and the file is there but it seems like the application can't read it well. Can you help me in this one? First year Manny is done!